The industry is further driven by evolving sustainability concerns, changing regulatory pressure and implementation of contract manufacturing. While the consumer demand for cheaper and better-quality devices is reducing product life cycles and leading to obsolescence, new products are quickly making their way into markets. This has endowed the industry with abundant opportunities for growth. To leverage the opportunities presented by the boom in consumer demand, CE businesses need to manage the growing complexity in manufacturing either by streamlining the existing forecasting, tracking, distribution and inventory management strategies or devising new ones that are integral to supply chain management. Since, the supply chains in the CE industry span over several stages of production and geographical locations, the need to have in place a robust and sophisticated system for streamlining the complex CE supply chain becomes evident. Blockchain – a revolutionary technology that draws on the capabilities of big data and digital technologies can be leveraged for mitigating the pain points of the CE supply chain. Increased Transparency: Every electronic product that we use today passes through a long journey of people, place and resources. This makes it difficult to trace the origin of these commodities, as well as the investigation of events (environmental damage) that might have occurred during the journey of products within the value chain. Since, there is no reliable way to verify the actual value of a product, consumers usually end up paying inaccurate estimation of the true production cost. Blockchain enables the tracking of the products moving within the supply chain ecosystem right from the point of manufacturing till it reaches the end-consumers. This ensures prevention of theft and counterfeiting. Maintains Tamperproof Record of Transactions: The transit of goods and the transfer of ownership across the supply chain can be tracked on a blockchain ledger in a synchronized way. Blockchain being immutable and a decentralized ledger does away with the chances of a single-point failure due to the presence of consensus mechanism, which requires every transaction to be validated by all the participants of the supply chain. Provides Digital Identity for Ownership of Goods: The CE industry is one of the industries that is most affected by counterfeiting, which not just damages the economy but also threatens the safety of consumers. 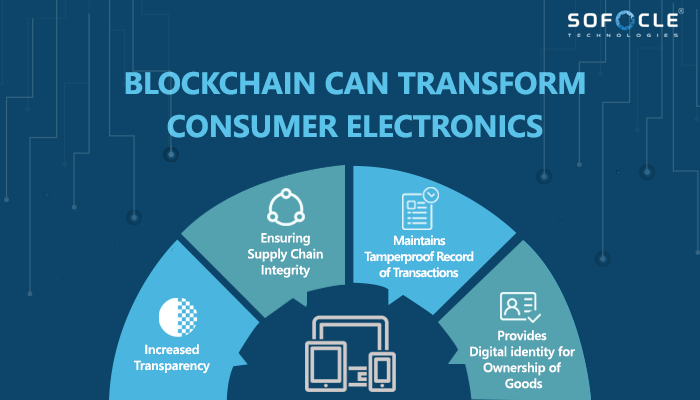 With a Blockchain based solution in place, manufacturers can leverage the digital identity tools for ownership and packaging of goods. This ensures the tracking of highly valuable electronic items across the logistic supply chain. Ensuring Supply Chain Integrity: With an iOT powered Blockchain solution in place, location-specific information regarding the state of the product or commodities moving down the supply chain is registered on the Blockchain ledger. The smart contract functionality of the Blockchain solution defines, as well as automatically enforces the contract terms and conditions in a secure and real-time environment thereby ensuring greater supply chain integrity. As value chains expand across companies and geographies, organizations dealing with CE products face an increasingly complex market. Blockchain – a distributed ledger technology can offer significant benefits and revolutionize the industry by helping organizations manage or remove inefficiencies and optimize on cost of product and most importantly consumer trust. Previous PostPrevious How Blockchain Addresses Issues Surrounding Data Ownership and Privacy? Next PostNext How Can Blockchain Help Businesses Resolve Issues Related to Product Recalls?